Duration : 2 hour 12 mins. 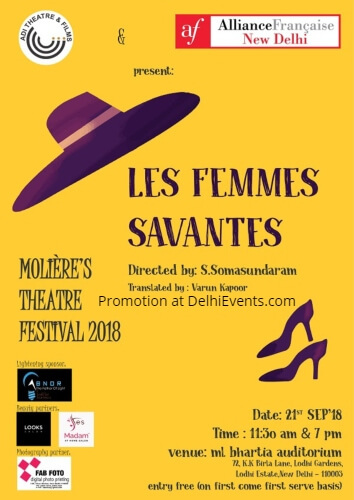 Event Description : Alliance Française de Delhi – Ciné-Club presents "Les Femmes Savantes" French Comedy Film with English subtitles. Two young people, Henriette and Clitandre, are in love, but in order to marry, they must overcome an obstacle: the attitude of Henriette's family. Her sensible father and uncle are in favour of the marriage; but unfortunately her father is under the thumb of his wife, Philaminte. And Philaminte, supported by Henriette's aunt and sister, wishes her to marry Trissotin, a "scholar" and mediocre poet with lofty aspirations, who has these three women completely in his thrall. For these three ladies are "learned"; their obsession in life is learning and culture of the most pretentious kind, and Trissotin is their special protégé and the fixture of their literary salon. To sum it up in one line, we can say "learning can make great fools". About Molière Theatre Festival : The first of its kind in India, is going to be a three day event, which will be hosted by ADI Theatre in collaboration with Alliance Francaise de Delhi. It has happened never in the history of India, that a festival is being performed on a particular French Author. Moliere's plays, written in the 17th century, are still performed all over the world in all possible languages. Most of his plays have an interesting backdrop : the common man. His plays often attack hypocrisy. The then plots, in which Molière has reveled in, are very strangely the unchanged social issues that are prevalent even in the 21st century. Our style of acting is close to Comedia de l’art and we specialize in body movement and master use of props.We are a rare breed of people, though we are amateurs, we work with a professional attitude and we thrive to work with the aim of creating new forms within theatre and to give our participants and our audience an educative experience that they would cherish for the rest of the life.